One of the most common questions I get is “How can I assign overhead costs to jobs on my job cost reports?”. Some of my colleagues have presented methods for doing this, and in rare cases it’s possible to come up with something that works, but MY answer is always “You don’t”. In my experience, for most contractors who work on more than one job at a time, attempting to assign overhead costs to jobs is speculation at best and providing completely false data at worst. 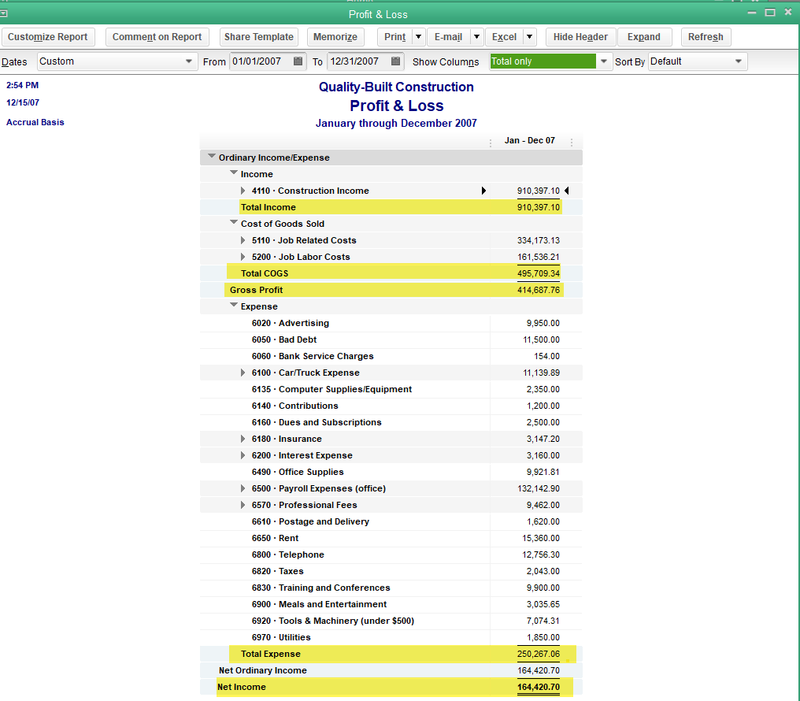 Most critically, attempting to assign overhead to jobs on job cost reports is almost always a replacement for what the contractor should be doing, which is analyzing (and understanding) their financial reports – the Profit and Loss and Balance Sheet. 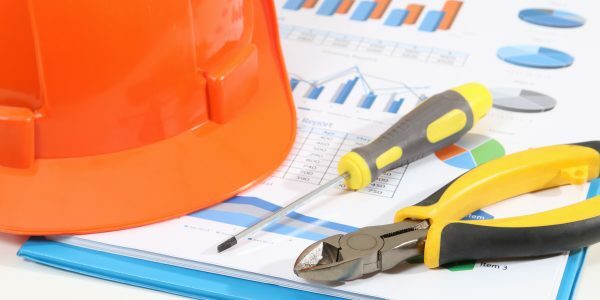 It’s no mystery that contractors desperately want to see the overhead costs on their job cost reports, because, unfortunately, your financial reports usually make very little sense. This is a result of what I call over and under-billing issues – very often a contractors billing or draw schedule does not match up, time period-wise, to the costs related to that billing. Oftentimes, the contractor is invoicing in lump sum amounts prior to costs being incurred – example: $100k draw in January, for the working being done/cost incurred mainly in February. Once you have adjusted your financial statements to account for over and under billing as instructed in this article, you are ready to answer the real questions behind the request for “overhead on job cost reports” ..
Those questions are usually these: “How is my company doing? I know I’m making some money off of my jobs but is it enough? Why am I not making enough money?, etc” and the answer to these questions can be found on your Profit and Loss Report, and can not be found on your individual job cost reports. In every business, there are Key Performance Indicators. In the construction business, one of the most important numbers to watch is the Gross Profit Margin – which is your Revenue less your direct job related costs. This is the variable that can make or break a construction business and you get these numbers from your Profit and Loss. Whether or not your intended mark up is achieved depends upon several factors – the accuracy of your estimating and of course the performance on the job (are your employees working hard or hardly working? Are you getting the best price on materials?, etc). Measuring these factors is the purpose of Job Cost reports and why they should be based up on your estimated costs vs. your actual costs by cost code (not simply a calculation of what you charged the customer less your costs for the job). If you are over your estimate on your actual costs, you will not achieve your intended mark up/margin and the job cost reports should assist you with things like identifying your cost overruns and/or help improve your estimating skills if you over or under estimated in certain cost areas. It IS possible, by looking at your job cost reports if you are achieving your mark up or not on each job. It is not possible, by looking at the job cost reports however, to determine if the mark up you are charging is enough to make for a profitable company or to determine the health of the company. That is the job of your Financial reports – The Profit and Loss and Balance Sheet. Once your Financial reports are adjusted for over and under-billing (as described in this article), you’ve got to know what you are looking at and what you are looking for when analyzing your financial reports. Although these reports contain a lot of numbers, the analysis is not overly complicated if you know what you are looking for. I always start with the END in mind when analyzing the Profit and Loss and therefore, before you get to the analyzing part of the Profit and Loss, you should definitely know what your Net Profit goal is. How much do you need to live on (assuming your wages aren’t already in the expenses), pay your taxes and have in excess/reserves to support your business? Don’t forget the “support your business” part! If anything should happen, a client doesn’t pay, you get mixed up in a lawsuit or face unexpected warranty costs, you’ll need to have the cash on hand to deal with this so as not to dip into your personal income. Am I achieving the mark up that I intend to? One thing I’ve noticed is that when we’re analyzing our individual job cost reports, we can shrug off minor overages a bit at a time, but these overages can really add up. If you divide your gross profit (which is sales less cost of goods sold) by costs of goods sold, you will see the actual overall margin you are achieving. Keep in mind: your gross margin % is NOT the same as your mark up% (see article on mark up vs. margin) If it’s not what you intended, this is when you are going to deep dive into the individual job cost reports – also – make sure that only direct job related costs that are attributed to a job are included in the cost of goods sold! If you are achieving your mark up goal, but not your net profit goal – are your overhead expenses unusually high for this period? Are your sales particularly low or under expectations for this period? What can you do about that? If your net profit does not meet your expectations, yet your income, mark up and overhead costs are all in line…. there’s a good chance your mark up is too low to support you and your business. I recommend analyzing your financials every month, and I often look at year to date by month as well as previous year comparison Profit and Loss Reports as well. The Profit and Loss report, however, is not the only critical high level financial report you need in order to get full insight into your business. You’ll also want to review the Balance Sheet, which many people ignore entirely, but is absolute gold when it comes to completely understanding your business. 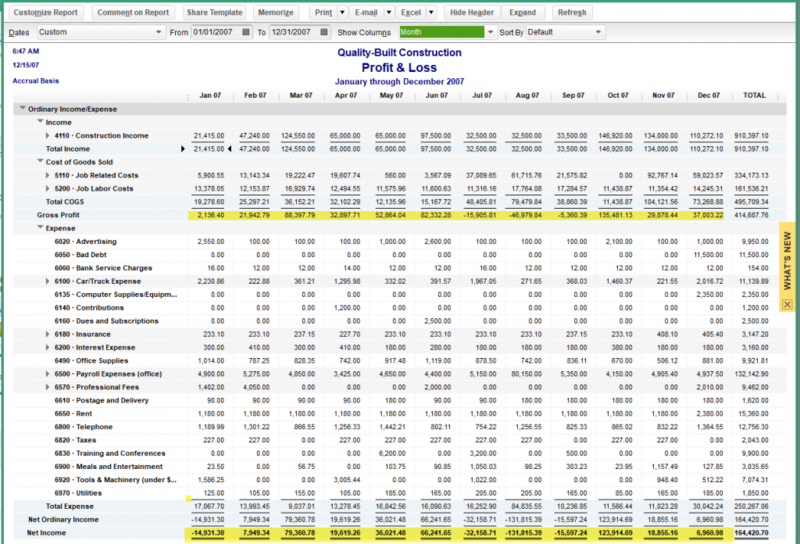 You can learn more about the Balance Sheet in this article called Why Focusing Only On Job Cost Reports Is a Big Mistake.